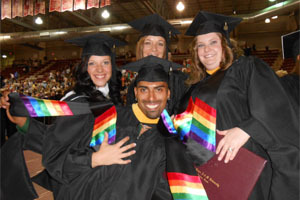 Buff Allies is a group of staff, faculty, and students who are committed to creating a safe campus for lesbian, gay, bisexual, transgender, queer, questioning, intersex, and asexual (LGBTQIA) members of the WTAMU community. Allies will have a Buff Allies or Buff Allies Safe Zone sticker on their offices to designate areas of support in which students can feel safe asking questions, seeking resources, or just hanging out. Allies welcome those who have questions or need resources but don’t know who or how to ask. Friends, family, and potential allies are invited to seek out a Buff Ally for a safe place to ask questions or seek resources. Buff Allies is a grassroots effort with support of the WTAMU administration. Together with Spectrum, the gay-straight alliance student group, we are committed to creating a discrimination-free campus for all, including our LGBTQIA friends and family. If you are interested in becoming a Buff Ally and/or becoming Safe Zone trained, you can contact Spectrum faculty sponsor, Kris Drumheller at 651-2816 or kdrumheller@wtamu.edu.